I'm finding it hard to believe that yet another week has flown by... where did it go? It seems to me that if you blink these days you miss it. I remember being told, when I was a child, that life passes by quicker when you are older... no-one said it would be this fast!! My Grandma used to say that she was always shocked when she looked in the mirror to see a little old lady staring back at her as she still felt about seventeen!!! I know the feeling... not quite reached the little old lady stage yet, but it's fast approaching!!! Talking of the older generation.. we had some sad news this week. The children's grandma, on their dad's side, died very unexpectedly in her sleep. She was in her early eighties, but there was no indication that she was at all unwell. Amazingly, she went on holiday to Australia with the children over Easter and they all spent 3 wonderful weeks together.. lots of happy memories that will hopefully help to see them through this difficult time. I am so thankful that they had this time to share together.. it really makes you realise that every day is precious and that putting ourselves out and spending time with those we love is never wasted. 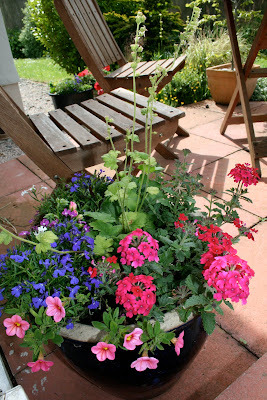 On a happier note... look at my gorgeous pot... the colours are so zingy!! 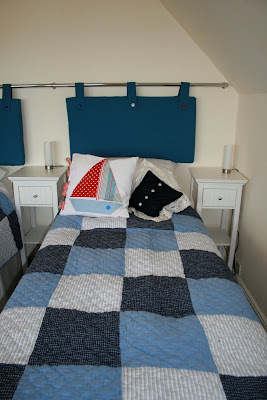 This guest room is called 'The Lighthouse'.... note the headboards and cushions on the bed!! A little boat.. appropriate for a house by the sea don't you think? 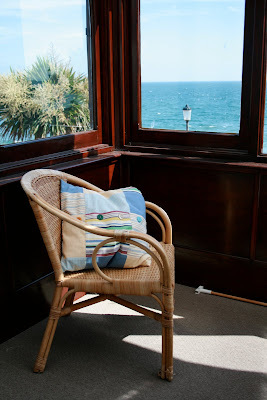 This is where I would sit with my morning tea and gaze out to sea... watching the comings and goings. This is the room that I stayed in and it really is my favourite... it's called 'The Sail Loft'. The views are stunning and it's light and airy and has such a peaceful feel about it. I slept each night with the window ajar and fell asleep listening to the waves gently lapping at the shore... who could ask for more?? More headboards and cushions... I lost count of the number of buttons we used.. over 80 at the last count!! The beds can be zipped together to make a huge super king sized bed and the headboards also slide together to make one single board... clever eh? We were so pleased with the way that the soft furnishings have pulled it all together... what do you think? If you are interested in going to stay or know anyone who would like some days away by the sea. please email me and I will let you have all the contact details. I totally agree with you (and your grandma) about time flying as you get older... It's scary isn't it! I don't think I could part with that house! I have been using Etsy (and finally made my first sale last night! woo hoo!) I have found it very easy to set up and use, and very cost effective - compared to somewhere like ebay. I have no experience of having my own website, but have avoided it thus far mostly on the basis that I think you have to pay a monthly charge for a website? Plus I'm not too clever with the techie web design stuff and wouldn't know where to start! Sorry for your sad loss. I have just set up another blog attached to my main blog. 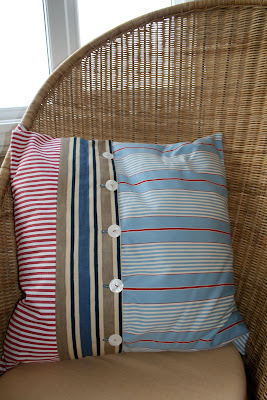 I love the cushions with the sailboats. Sorry... email address now on profile info!! I haven't used either as a seller but unless you are sure you will be able to upkeep a dedicated website I'd try esty or one of the more UK or european ones first as there is nothing worse than a badly done or worse not working website.. I think the other advantage of them is exposure as to get people to your own website they have to find you, on something like Etsy they are there already though you are competing with others. UK site I know a few people using. One tip I was given for etsy was spread out listing your items rather than putting them all up at once that way you are in the most recently listed items more and therefore more likely to be seen. Sorry to hear about your grandmother, but how lovely your children got to have a very special Easter with her. I love the soft furnishings, they really have pulled everything together nicely and it looks a wonderful place to stay. Gorgeous cushions, I love the one with the sail boat on. I love the sound of the sea, our cottage is full now till the beginning of August, and I am starting to get withdrawal symptoms already! I would start with a etsy shop, as you say a website is an expensive job. What i didn't think about is how to market it? I have a great site . . . how do people know about it? They already know about etsy.. 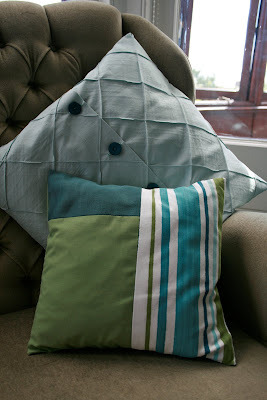 I just wanted to write how much I love the cushions - the ones with the little boats on are my favourites! I bet it was lovely to sleep in that little room too, your folks are very lucky to have such a gorgeous business, I wish them well with it. Very sorry to read about your sad news, sending love to you and your family.